The magic of modular to improve your experience. Modular design – when major machine components can be configured in such a way that parts can be removed, changed and upgraded depending on the needs of the customer – is making a comeback in blast equipment after falling out of fashion due to parts, particularly in the metal forming industry, becoming more standardized. Our customers are now looking at modular design as an innovative way of helping them maintain machines or bring them up to date as efficiently as possible. Thanks to modular machine design, the major components of blast machines – the elevator, separator and blast wheel – are now much easier to maintain, modify or upgrade. Our elevators no longer have a solid casing, but have removable side and end plates to allow technicians to access the internal components. This is particularly useful for customers with heavy-duty operations, for example in the foundry, forge and automotive industries. In addition, machines are being integrated in cells as part of lean production environments. Modular design is particularly relevant where space is at a premium and machine footprints are kept to a minimum, a trend driven in part by rising real estate costs. For example, there isn‘t always enough height for standard multi elevators. With modular design these parts can be configured differently, so that less height is needed to accommodate them. It’s not just about lean environments though – modular design is also about flexibility. If more abrasive needs to be added to a process, a modular screw conveyor section can be unbolted and replaced, where previously it would be welded in place and more significant work would be needed to change it. Alternatively, if the velocity of abrasive needs to be changed, it’s now much easier to switch blast wheels to the appropriate specification. With modular design, parts can be changed more quickly, meaning less downtime is needed. Modularity also allows for greater flexibility in component size. We’re now able to offer four different sizes of elevator to suit the needs of individual customers. This “machine tuning” creates processes that are as efficient as possible by ensuring machines aren’t overpowered or overproducing. It also means that less design time and resources are needed to tailor a machine to specific requirements, making it more cost-effective for customers. And Wheelabrator isn’t just providing this level of modularity for its own machines, but for non-Wheelabrator equipment too. 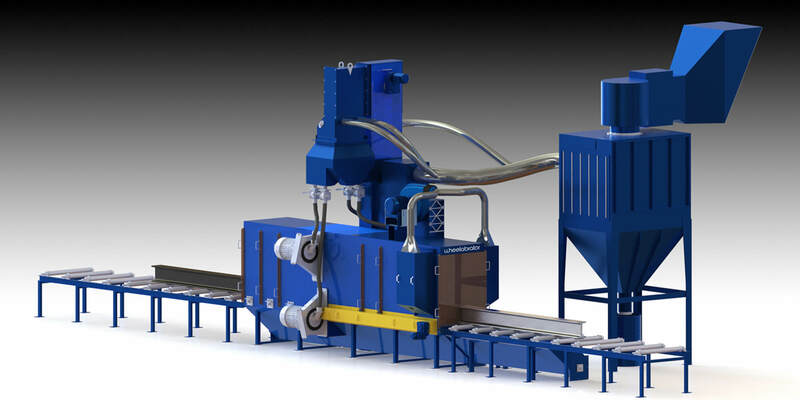 Standard Wheelabrator modules can be fitted to any type of blast machinery through the use of adapters. Safety is another area in which modular design can play an important role. For example, a control panel from the 1960s is unlikely to meet current safety standards. But by using modular electronics, we can retrofit a control panel to include new functionality to bring it up to modern standards. This can be as simple as replacing a single button to open a blast machine with two buttons that must be held down simultaneously to perform the same process, thus ensuring accidental opening of a machine is more difficult, improving safety. A control panel could also be modified to include a button to operate a light curtain that could be activated when a machine is in operation. If anyone crosses the light curtain, the machine would automatically shut down, to avoid risk of injury from moving parts. We’ve been upgrading customer machines through our Equipment Modernization Programs (EMPs) for more than 30 years, and modular design is the latest evolution in how we help customers address their changing needs. The next step will be to create more replacement options with fewer pieces, which essentially means the same parts can be used for a greater number of functions. There is no reason why a shaft to drive a pulley in the elevator can’t also be used to for the screw conveyor, for instance. While modular design is nothing new, the current environment has made it more relevant than ever. And we’re working hard to evolve the concept as new ways are needed to help customers address their changing needs in ever smarter ways.